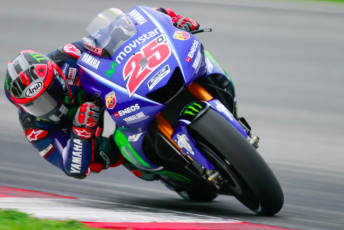 New Yamaha signing Maverick Vinales ended the MotoGP official pre-season test on top after a rain-affected final day at Sepang. The Spaniard lit up the timing screens early in the afternoon when he clocked a 1:59.37s aboard the 2017 specification Yamaha. Vinales’ time stood for the remainder of the session as rain interrupted running for an hour. The effort was the fastest lap of the three-day test. World champion Marc Marquez produced a strong display as he finished in second spot, 0.13s shy of Vinales. Marquez was more than a second quicker than his best effort from the previous two days. Andrea Dovizioso proved the fastest Ducati rider while two-time world champion Casey Stoner was seventh as he returned to the fray after sitting out Tuesday. The manufacturer’s high profile recruit Jorge Lorenzo continued his acclimatisation to the GP17 by finishing ninth just 0.3s adrift of the pace. Honda’s Dani Pedrosa was fourth fastest ahead of Yamaha’s Valentino Rossi, while Aspar Ducati’s Alvaro Bautista continued to impress in sixth. LCR Honda rider Cal Crutchlow posted the eighth fastest time. Moto2 graduate Johann Zarco (Tech3 Yamaha) rounded out the top 10. Australia’s Jack Miller showed encouraging signs in 16th position while new squad KTM occupied 21st and 23rd courtesy of Bradley Smith and Pol Espargaro. MotoGP pre-season testing continues at Phillip Island from February 15-17.